Poker is full of philanthropists who use their love of the game to help others when they have the chance, so it should surprise no one that a number of players and people within the industry are getting together for the second annual All In for CP tournament at the Hard Rock Hotel & Casino in Las Vegas on Saturday, Dec. 12, 2009, at 2:00 p.m.
Set to benefit The One Step Close Foundation, a nonprofit organization whose main goal is to have an impact on the lives of those suffering from cerebral palsy by working with support groups, individuals who have CP, and by providing money for research. Scheduled one day before the Doyle Brunson Five Diamond World Poker Classic and hosted by actress and WSOP-bracelet owner Jennifer Tilly, there will be plenty of poker pros and celebrities in attendance. Some of the big-name VIPs scheduled to play include Sam Simon, Phil Laak, Dean Cain, Glenn Morshower, Jamie Gold, Barry Greenstein, Clonie Gown, Alicia Webb, Montel Williams, Brande Rodrick, Shannon Elizabeth, Doyle Brunson, David “Chino” Rheem, Tiffany Michelle, Maria Ho, Robert Williamson, Eli Elezera, Men “The Master” Nguyen, Kristy Gazes, Karina & Chip Jett, Layne Flack, Freddy Deeb and Scotty Nguyen. If you want to show your support for the cause and make a worthwhile donation to the charity, sign up for this $500+$50 no-limit tournament, which features $200 rebuys for the first 90 minutes. Fifty percent of the money raised will go to the charity and the rest will go to the prize pool. 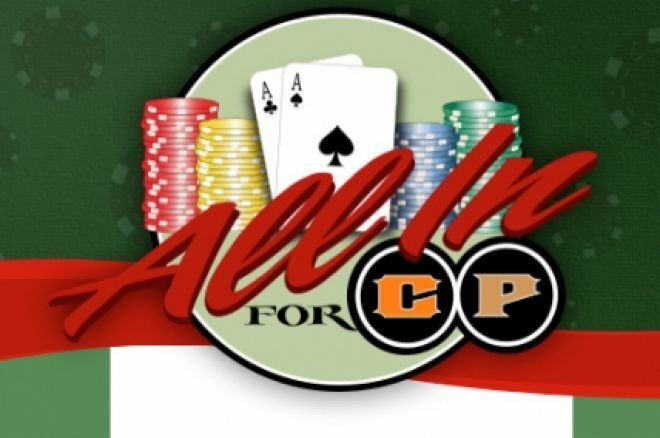 For more information on this amazing event, visit allinforcp.com. Follow us on Twitter for up-to-the-minute news and also become our fan on Facebook.